Before the meteoric rise of one of the most recognizable actors of the 90's and beyond, a virtually unknown actor was cast as a dimwitted high school metal head, teaming up with another virtually unknown actor in a buddy movie franchise that has spawned one sequel, and continuous rumors of another sequel in the works. That actor was...Alex Winter (who???)... I mean Keanu Reeves. Both actors had been on the scene for a few years, but both were still fledgling artists in 1989. Winter, for his part, was most prominently known as one of Keifer Sutherland's cohorts in The Lost Boys, and Reeves had a role in the teen drama River's Edge. This would prove to be the launching pad for Reeves as a box-office draw. 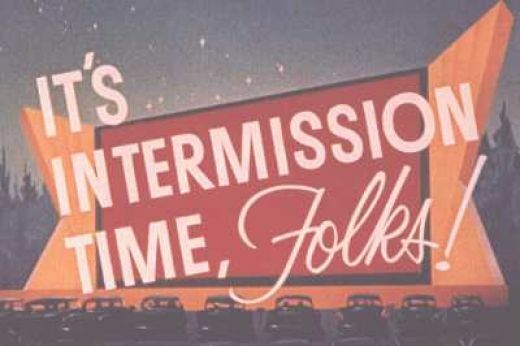 Unfortunately, Winter did not see the same success, at least not in the theater, but his career took a different tack, working mostly behind and in front of the TV camera. 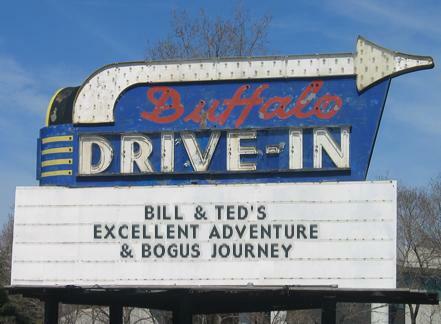 The first Bill and Ted movie arrived in theaters in early 1989. Pitted against such blockbusters of the year as Tim Burton's first Batman, Ghostbusters II, and Indiana Jones and the Last Crusade, the movie still managed to find an audience and made enough of a profit that a follow-up was green-lighted. That movie too managed to garner a profit. Over 20 years later, in 2011, a rumor began circulating, one which Reeves and Winter both acknowledged, that a third movie was in the works, to catch the two as they approached their 50's, but this has yet to come to fruition. 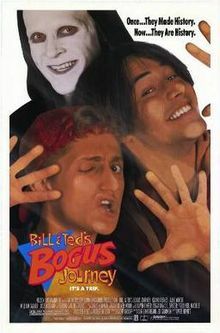 The Bill & Ted franchise concept was the brainchild of Ed Solomon and Chris Matheson, and, as near as I can tell, with the exception of a couple of the later series episodes of Laverne and Shirley, neither had any writing credits to their name. They seem to have hit at just the right time with this, however. That happens in Hollywood, sometimes. One or a group of people just hit on something that connects with people on a certain level. I must admit, however, that the crowd that this one hit with was a good 10-15 years younger than I was at the time, but yet I still got a kick out of it, especially the first one. And every time Poison's "Every Rose Has It's Thorn" comes on the radio, I find myself imitating the two vocalizing the lyrics as if they were profound quotes from a philosophical guru. I should warn you at the beginning, if you approach this movie with any hope of having it adhere to the concept of time travel and its inherent potential for paradoxes, you are doomed to disappointment. The film plays fast and loose with the scientic part of the theories. (And there are some legitimate theories out there, even if the possibility has yet to be proven concretely). In the present of 1988, Bill S. Preston, Esquire (Alex Winter) and Ted Theodore Logan (Keanu Reeves) are two brain dead slackers who are on the verge of failing history. Their teacher, Mr. Ryan (Bernie Casey), tells them in no uncertain terms that they must get an A+ on their final exam, an oral presentation, if they are to have any hope of passing his course. The two are approached by Rufus, who has come from the future to give them use of his time machine to help them pass history and thus save history as he knows it; a future in which the music of Wyld Stallions, their wannabe band, is actually a profound influence. The two go back to France in the 1800's where they encounter Napoleon, and through an accident bring the French icon into the present. Leaving Napoleon in the care of Ted's little brother and venture into the past where they abduct Billy the Kid and Socrates. They also end up in medieval England where they fall in love with two princesses, the daughters of the king. Seeking "extra credit", they venture back and get several more historical figures; Joan of Arc, Sigmund Freud, Ghengis Khan, Ludwig van Beethoven and Abraham Lincoln. Bringing them to the present, they unleash them on the local mall, and try to track down Napoleon, whom Ted's brother ditched because he was too annoying. The historical figure wreak havoc on the mall, and Napoleon, who has found his way to a water park called Waterloo is doing the same thing. Finally gathering them all together, the two slackers manage to do a presentation at their history exam, which wows the assemblage. Rufus congratulates them and presents them with the princess from the past as a present. But they are still incompetent musicians. One can only hope that they "do get better" as Rufus promises to the audience, "breaking down the fourth wall", as it is known in the argot of film. It is a couple of years later. The boys and their girlfriends (the princess from medieval England) have formed a band. But the boys are still losers and haven't got a clue, how to play their guitars or anything else for that matter. Meanwhile, a renegade from the future, De Nomolos (Joss Ackland) has engineered a plan to change the future by killing Bill and Ted before they can be the influence they eventually become. 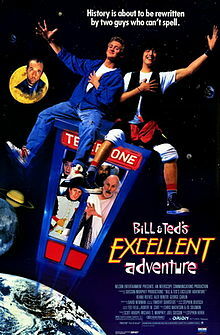 He commandeers his own time machine and sends two Bill and Ted look-alike robots to do the job. On their "bogus" journey they end up in Hell, where they find that Hell is rather personal, each of them forced to endure their own personal nightmare. Bill has a granny, (played by Alex Winter with tons of makeup), ugly as sin, that wants a kiss and Ted has to escape a military school leader who wants him to drop and give him infinity in pushups). They eventually escape Hell and get to Heaven, where the big guy in charge gives them the services of the best scientists in the universe (a couple of aliens) to help them defeat the evil robot usses. In a showdown at the "Battle of the Bands" (in which Wyld Stallions were to perform, don't ask how they managed that...), Bill and Ted and their creations, the good robot usses, battle the evil robot usses to try and save the day. Of course, if they defeat the evil robot usses they will still have to deal with De Nomolos who is flat out determined to change the future, at whatever cost. One can only wonder what happens in the future that causes these two to become the prophets of peace and harmony, when it's obvious they probably couldn't even SPELL "peace and harmony" without a spell check. But since this is just goofy Hollywood time-wasting, its probably better not to dwell on it. Well, folks, the screen has just darkened and a phone booth has materialized in the parking lot, so your humble reviewer may be off on an adventure for himself. Have a safe drive home. I'm not a big fan of the sequel. But the ending is pretty good. The first one is a classic. I hope they do a third, but it's looking less and less likely.